Whenever James Newton Howard team up for a film, the result will almost always be great, sometimes showcasing the composer's best work. The millenium film Unbreakable was an interesting story in itself. As opposed to M. Night Shamalyn's usual thrillers (back when he was actually a director) it took a dark comic book route that caused disdain from critics and moviegoers but turned the film into a cult classic. That being the approach, James Newton Howard had to look at things differently than scoring a suspense film. The opening track 'Visions' is immediately a strong indication that JNH scored the assignment differently. It uses a dance style beat overlaying the usual mysterious violins, similar to his work on Dreamcatcher years later. Despite this, alot of the music that follows does feature orchestral score but rather than the melodic style of The Sixth Sense and Signs, it is more mysterious and hopeful. For the villainous but fragile character of Elijah, JNH gives an emotional theme supplemented perfectly by the piano. JNH also manages to counter the soft theme by occasionally using darker and brassier motifs, hinting at the character's true nature. 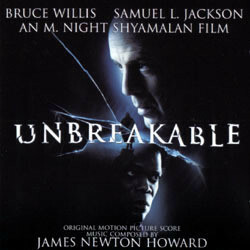 The dance beat theme makes a return as well, highlighted in 'Unbreakable', and representing Bruce Willis's character's eventual discovery and use of his powers. Alot of JNH's orchestral skill does crop up throughout the score. There are great little moments of suspense. Softer melodies like 'Carrying Audrey' or the orchestral powerhouse of 'The Wreck' really do shine as well. The main motif for Bruce Willis's character, a lone trumpet solo, symbolizes heroism and bravery and is a nice little nod to the various superhero scores in films and gets a nice treatment in the end credits. Whenever James Newton Howard and M. Night Shamalyn team up, the result will generally be good. Many of Howard's strong suits (recognizable themes, great orchestrations) are highlighted here. While the score may not be as experienced or memorable as The Sixth Sense and Signs, it still packs a powerful punch and shows that JNH can tackle a project as unique as Unbreakable and still walk away with a great score to boot.